We’d love your help. Let us know what’s wrong with this preview of Evenfall by Liz Michalski. In life, Frank could've had any woman he wanted. Frank Wildermuth always regretted a mistake he made as a teenager: choosing Clara Murphy over her sister Gert. And like a true Murphy woman, Gert got on with her life, never admitting to heartbreak. Not even now, decades later, with Frank dead-dead, that is, but not qui In life, Frank could've had any woman he wanted. To ask other readers questions about Evenfall, please sign up. I love ghost stories. I usually sway towards ghosts of the viscera, blood, and hauntings variety. This was the complete opposite. Evenfall is a ghost story about love and family, and a really nice one. Always, always, I see Gert. Sunlight is on her hair, a small hand tugs at her dress, and when she turns to 4.5 stars. Always, always, I see Gert. Sunlight is on her hair, a small hand tugs at her dress, and when she turns to me, her face is alight with joy. This is how our lives were meant to be, she tells me, and from my distant place in time I can only nod. The story focuses on Frank's ghost, his sister-in-law (and eternal love) Gert, and their niece Andie. At 33, Andie is drawn back to Evenfall, the farm where she spent most of her childhood to help Gert settle Frank's estate. The plot is relaxed, slow almost, taking time to develop the characters and their pasts. Not slow like a traffic jam, but slow like a glass of ice cold lemonade in the shade. The dialogue is sharp, and every character sounds like themselves. Good dialogue will win me over anytime. Also Cort? I don't swoon over fictional men much, but damn. Swoon mode activated. I'm not sure how else to say it but this way -- I really, really didn't want this one to end. 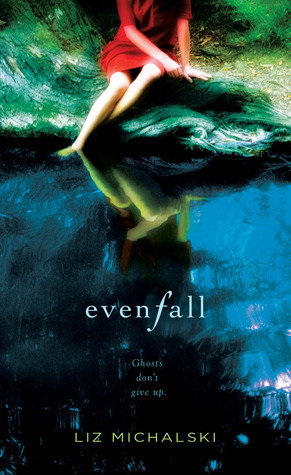 Scheduled for release in February of 2011, Liz Michalski's debut novel, Evenfall is quite a story, and one I intentionally slowed down in my reading towards the end because I really didn't want to commit to the fact that all stories have to end. I'm so happy that I picked this one up at the SIBA Trade Show last month. Each chapter of Evenfall takes a third-person point-of-view of three important people: A I'm not sure how else to say it but this way -- I really, really didn't want this one to end. Each chapter of Evenfall takes a third-person point-of-view of three important people: Andie, Frank, and Gert, living on beautiful land in Connecticut called Evenfall. It's land that has been owned for a couple hundred years by one family, and at one time, it was the talk of the town with money galore. But over the past fifty years or so, it's been hard farmland to work, and it's now become simply just a home with work to be done. Andie is the young woman who's just returned from Italy -- she's caught her oh-so charming boyfriend with another, and it's time to get away. Her Aunt Clara has already passed, and now so has her Uncle Frank. It's time for her to come to Evenfall to help Aunt Gert clean it up to possibly sell. She has no bond with her own father, who dropped her off at a boarding school each fall when she was a kid, and then dropped her off at Evenfall each summer. She's been lucky to have her two aunts and uncle to give her a sense of family. And although this summer will be a hard one filled with memories that jump out from every room of the old house that will be looked at by real estate investors, she's especially unprepared for the young boy she once babysat who has now grown into quite a capable young man. A break from men and life's decisions she will not get. Aunt Gert, nearing eighty, has spent a lifetime as a take-charge nurse who also served in WWII -- she's not a woman to be messed with. Aunt Gert has lived on the land in a small cottage since Andie was a kid, while the love of her life, Frank, was married to her sister, and living in the main house just a short walk away. I could imagine that feeling and how difficult it must have been for Gert. It's built her toughness to the point when it's not often anyone or anything can really crack it. And Frank. Frank may have been my favorite character, but it's hard to say since I enjoyed each one. He's now dead, but he's certainly not gone, and he hovers about the house, having the ability to move from place to place simply by thinking about it. Gert is really the one he was always meant to be with, but bad timing and perhaps the subtle thought that there was always time, kept him from making the right choice. Regret can almost feel like its own character, and in Evenfall, the weight of its presence was felt through every page. Frank, though, is not ready to have it be part of him any more -- he's going to make it right, and sometimes he can project his presence to the point where Gert can feel him around her. It's not the time anymore for him to just sit back and let time slide by. Evenfall is genuine. Every character had its own peculiarity and distinct personality that it never once felt jarring when the point of view switched from chapter to chapter as it sometimes can in other stories. Their actions were real and organic to who they ultimately were. Even the movements and thoughts of Frank's ghost were written so authentically that I felt confident that this truly would be what a ghost would be able to do, to think, to feel, in their afterlife. I felt surrounded by so many things as I read this. Enveloped by the humid richness of the New England summer, the descriptions of farmland, peaches, and the setting sun so real I could see it before me. And reminder. Regret makes an incredible story, as Liz Michalski does with Evenfall, but it certainly does not make a good life. I was reminded to enjoy the moment, to see what was before me, and to not just pay attention to what, but most especially to whom. As soon as I realized the narrator was a ghost, I was immediately hooked by the opening of Liz Michalski’s novel, Evenfall. What drew me even further was the description of the New England farmhouse Frank, the ghost, inhabits, as it so reminded me of the kinds of old houses I love here in rural southwestern Michigan. The house, Evenfall (cool name for a house, and fantastic title for a novel), becomes one of the primary characters of the novel, as do the nature and animals that surround it. As the story opens, we meet Cort, a local young man, as Frank does. Cort seems to be snooping around the apparently empty house. When Gert and Andie—Frank’s sister-in-law and niece respectively—show up to look into Cort’s uninvited presence at Evenfall, Michalski begins to reveal the complex weavings of the four main characters’ relationships and histories. The cast is rounded out by Nina, Frank’s dog, a former stray that lives at Evenfall. Michalski deftly wields the literary device of the dog’s presence. From her telling acceptance of Cort in the opening, Nina’s importance as a plot element continues to flourish. Being an avid dog lover, Nina quickly became a favorite of mine. The story of Evenfall takes place in summer, but that alone is not what makes it such a perfect summer read. I found the pace soothing, and the story and setting refreshing; full of lemonade, lightning bugs, peaches, and summer storms. I could almost hear the screen doors thumping and the crickets chirping as I was pulled into, and along by, the lovely mesmerism of Michalski’s artistic prose. By soothing, I don’t mean to infer there is no tension. For me, the intrigue of digging deeper into the characters’ back-stories, as their interactions ramped up the drama, really kept the pages turning. I could hardly put this book down, and finished it too soon, in about four enchanting summer reading sessions. I found the ending both surprising and satisfying, and the story haunted my thoughts for some time afterward. So whether it’s hot outside and you’re looking for that perfect summer read, or the cold months have you down and you’re longing for a taste of the long, warm days to come, read this book and you’ll get your summer fix. This book is one that I couldn't put down once I got into it. It's about, love, loss and there's a lot of tough choices that need to be made. Frank, a deceased uncle to the main character sticks around and realizes that he married the wrong sister. I would recommend this to anyone. Beautiful, gorgeously descriptive story about regret, goodbyes, and second chances. Must read!!!!! I loved the premise, a ghost, Frank, not giving up on his love for the woman he did not marry, Gert. Gert is unmarried and in her eighties and dealing with Frank's recent death. Her thirty-something niece Andie has come back home to nurse her wounds after the end of a three-year relationship with Neal and to help her aunt. She stays at Evenflow, Frank's old farmhouse where his ghost now resides. The story is told round-robin from the points of view of Frank, Andie and Gert. I loved reading this w I loved the premise, a ghost, Frank, not giving up on his love for the woman he did not marry, Gert. Gert is unmarried and in her eighties and dealing with Frank's recent death. Her thirty-something niece Andie has come back home to nurse her wounds after the end of a three-year relationship with Neal and to help her aunt. She stays at Evenflow, Frank's old farmhouse where his ghost now resides. The story is told round-robin from the points of view of Frank, Andie and Gert. I loved reading this women's fiction story that involved two mature women. And I really the heat between Andie and twenty-three year old Cort ("little Cortie" the boy she used to babysit). Cort loved her back when he was eleven and watched her go out on dates with the older boys. Twelve years later, he's man enough to do something about his feelings when she comes home. I enjoyed watching Andie and Cort, saw the love and felt both their pains when they fought. Of course, her old boyfriend turns up right at that vulnerable moment. This book unfolds slowly and deliberatly, as I rooted for Cort to fight for Andie and for Frank to find some way for a ghost to interfere with the living. "..when she stands in front of me she looks for all the world like my heart's desire at eighteen." Evenfall was slow at first and never really speeds up, but towards the end, it really does get interesting. I loved to read Gert and Frank's relationship history. I thought they were adorable. And I loved Cort to pieces. Him and Andie worked out perfectly, at least, in my head. I bet there would be a lot of complications but I know they would be able to work them out. It really angered me when Neal "..when she stands in front of me she looks for all the world like my heart's desire at eighteen." Evenfall was slow at first and never really speeds up, but towards the end, it really does get interesting. I loved to read Gert and Frank's relationship history. I thought they were adorable. And I loved Cort to pieces. Him and Andie worked out perfectly, at least, in my head. I bet there would be a lot of complications but I know they would be able to work them out. It really angered me when Neal came back though. I hated Neal so much, he was actually building up so much dread and annoyance in me that I wanted to cry haha. (view spoiler)[The terrible part when he claimed he didn't know Nina was behind his car broke me. The fact that he only came back to Andie was so he could sell Evenfall. It was terrible reading Andie and Neal's parts because I knew he didn't care about her and because of Cort. Some of his lines were so heartbreaking, especially during Andie and his first fight, and when Andie saw him at the bar. I was really happy with the ending, though, and although it was open-ending, I know that Cort will go visit Andie. Evenfall was described beautifully and throughout this whole book, it made me want to live there with all the land and the creek and the fresh air. I received this book from a friend of the author. I really enjoyed the book and it was a easy read. But something about the book left me wanting and not wanting in a good way...like the wanting some books do, in a way that makes you truly feel like you understood where the characters were and could create the rest of the story the way you wanted to. What I WANTED was to find more depth in the main characters...especially Frank and Andie. I don't feel like I REALLY knew Andie - but maybe that is b I received this book from a friend of the author. I really enjoyed the book and it was a easy read. But something about the book left me wanting and not wanting in a good way...like the wanting some books do, in a way that makes you truly feel like you understood where the characters were and could create the rest of the story the way you wanted to. What I WANTED was to find more depth in the main characters...especially Frank and Andie. I don't feel like I REALLY knew Andie - but maybe that is because she didn't really know herself, I don't know. HOWEVER, I DID love the author's descriptions of Frank's ghostly life. I could visualize his "existence" in a real way and while I don't believe in ghosts, I think that if they exist, their experience would be just as the author has described! 4.5 stars - I really enjoyed it, especially the multiple narratives. But it is rather open-ended; there's more to this story that I want told. And just six hours later, I received a very personable response to my email! I'm intrigued by the concept of what she's currently working on; I believe I now have an addition to my fav author list. picked this one up at a yard sale-interesting yard sale because so many books I have never read. Unusual for me. Just picked this one up because I liked the cover. Didn't put the book down until I finished it-didn't want to stop. I won this book as part of the goodreads giveaways and am looking forward to receiving my copy. Thank you Goodreads! I loved this book. Amazing story of love that perserveres and reminder of what is important in life. Take risks! I loved this beautiful novel! So grateful to have met Liz and found her lovely book! Great read...and I'm not just saying that because the author is a dear friend of mine. I can't wait for her next novel!! Keep writing Liz!! A beautifully written, magical bittersweet book, Evenfall is a sensory, evocative treat that made me long for country summertime, a cold beer, fresh goat cheese, and new love. I really loved this enchanting book. The characters are vivid and endearing, and Michalski gives them distinct and memorable voices. I also liked her use of the present tense to tell the story; it highlights the ways in which memory and the past are woven so deeply into Evenfall and into concepts of family and home. Descriptions of the land and farm are beautiful, as are the details of objects in the house -- maps and marbles, cups and rings. I can visualize it all. The shifts between past and p I really loved this enchanting book. The characters are vivid and endearing, and Michalski gives them distinct and memorable voices. I also liked her use of the present tense to tell the story; it highlights the ways in which memory and the past are woven so deeply into Evenfall and into concepts of family and home. Descriptions of the land and farm are beautiful, as are the details of objects in the house -- maps and marbles, cups and rings. I can visualize it all. The shifts between past and present are seamless, and the secondary characters are fully realized and so effective in moving the story forward. Highly recommend. I liked this book but disappointed in the end. This book is written from three different points of view. First, there is Andie, a 30-something young woman who comes back to the farm where she spent summers as a child with her Aunt Gert, Aunt Clara, and Uncle Frank. Clara and Frank have died and Andie returns to the farm to help Gert clean the house out and get ready to possibly sell it. Gert is the second character whose point of view we get to see. As a young woman, Gert and Frank were in love, but a combination of circumstance and choices This book is written from three different points of view. First, there is Andie, a 30-something young woman who comes back to the farm where she spent summers as a child with her Aunt Gert, Aunt Clara, and Uncle Frank. Clara and Frank have died and Andie returns to the farm to help Gert clean the house out and get ready to possibly sell it. Gert is the second character whose point of view we get to see. As a young woman, Gert and Frank were in love, but a combination of circumstance and choices kept them from marrying. Frank ended up marrying Gert’s sister Clara instead. Frank, still in love with Gert, lingers on as a ghost. One of the best parts of the book is that Frank’s ghost is an actual character and the third point of view the book is written from. When I first picked this book up, I thought the story sounded great, but I was a little worried about how the ghost element would manifest itself. Hauntings and ghosts in books, especially romance books, often come across as silly "bumps in the night" and “signs” from a lost loved one. Boy, was I glad to be wrong in this case. From the very first pages, we know that Frank is a ghost and a prominent character in the story. This whole scenario requires a little suspension of disbelief, it is fiction after all, but I really think Frank's ghost adds a lot to the story. I won this via ARCs. I hate that I had to give Evenfall 3 stars. The overall plot was great, but the characters were somewhat lacking. Cort is the only one I really liked. I don't know but its always the heriones I have the problem with and not the heros. But anyway. Evenfall is actually the name of a cottage in Hartman, Connecticut that Frank and Clara lived in. I love it when houses have names. It makes them seem more elegant. Based on the book description I thought Frank I won this via ARCs. Evenfall is actually the name of a cottage in Hartman, Connecticut that Frank and Clara lived in. I love it when houses have names. It makes them seem more elegant. Based on the book description I thought Frank would have some kind of contact with Andie and Gert. Instead they hear whispers that they believe to be the wind. I liked the flashbacks of Gert's youth and when she first met and fell in love with Frank. However, I did not like Gert as a person. She came off as cold. Even in the book Frank points out that she came back with a heart of steel. I get that she hardened her heart but it was her fault. Frank couldn't leave and Gert didn't want to stay. Somewhere I think there should have been a compromise if they really loved one another. Instead Gert goes to Europe and becomes a nurse during the War and her siser Clara marries Frank. Andie. Andie. Andie. What can I say. She did not have the best role models. She takes after Gert a little bit too much. If a woman came and saw me for the first time and called me a "it" instead of a "she" then I wouldn't take to her. And Andie is completely screwed up in the love department because of her low-down alcoholic father. Her relationship with Neal completely set my teeth on edge. Andie even says that there are things between them that can't go away overnight. Why the hell not? If he cheats on you for a period of time and you find someone that compliments you and wants and loves you, I would go with the latter. Andie is all Cort wants, but she sees their relationship as a summer fling. Liz Michalski's debut novel, "Evenfall," is a beautifully rendered, bittersweet tale of love and loss. Wrapped around the three vivid point-of-view characters and a strong supporting cast that includes the setting is the powerful theme of how the tough decisions we make can have cascading effects that haunt us for the rest of our lives. Speaking of haunting, one of the main characters, Frank Wildermurth, is a ghost. Andie Murphy, his 33-year-old niece, has returned from the implosion of a three-y Liz Michalski's debut novel, "Evenfall," is a beautifully rendered, bittersweet tale of love and loss. Wrapped around the three vivid point-of-view characters and a strong supporting cast that includes the setting is the powerful theme of how the tough decisions we make can have cascading effects that haunt us for the rest of our lives. Speaking of haunting, one of the main characters, Frank Wildermurth, is a ghost. Andie Murphy, his 33-year-old niece, has returned from the implosion of a three-year relationship in Italy to settle her Uncle Frank's estate in rural southeastern Connecticut. Andie's aging aunt, Gert Murphy, a no-nonsense woman who drives her crazy, is living in the cottage. When young Cort McAllister shows up at the estate one day, the Murphy women put him to work doing odd jobs cleaning up the ramshackle estate property, called Evenfall. Andie remembers Cort as the little 11-year-old boy she used to babysit, but now he is a strapping, handsome young man and sparks soon fly between them. The budding relationship is complicated when Andie's ex-boyfriend, Neal Roberts, shows up and tries to win her back. Aunt Gert is tempted to get involved, though it's against her nature. "Gert's made a lifetime out of walking away, out of keeping herself to herself, avoiding other people's troubles," she reflects at the beginning of one key chapter. Indeed, many years earlier, she had walked away from a love struck Frank and enlisted as a nurse in the war. Meanwhile, Frank is a spectral presence who is still grappling with the decision he made years ago to choose Gert's sister, Clara Murphy, over his true love. Michalski skillfully handles the story's paranormal aspects as Frank's presence is subtle and there is no over-the-top magic here to cloud the story. In the end, Andie must follow her heart, a lesson Frank learned the hard way. I thoroughly enjoyed this novel and I highly recommend it. Evenfall is a story of a lost love. A missed love. In Hartman, Connecticut the beautiful home named Evenfall stands. It's where Frank and Gert fell in love, and where Frank stayed and married Gert's sister, Clara. The unfinished story between Frank and Gert was so strong, it lived even after death--because Frank couldn't leave Gert. Frank's ghost lived on. Reminding Gert of what walking away had cost her. Andie Murphy, is the niece of Frank and Gert. She has come back to Hartman to help her Aunt Evenfall is a story of a lost love. A missed love. In Hartman, Connecticut the beautiful home named Evenfall stands. It's where Frank and Gert fell in love, and where Frank stayed and married Gert's sister, Clara. The unfinished story between Frank and Gert was so strong, it lived even after death--because Frank couldn't leave Gert. Frank's ghost lived on. Reminding Gert of what walking away had cost her. Andie Murphy, is the niece of Frank and Gert. She has come back to Hartman to help her Aunt clean out Evenfall and to run away from her old flame Neal. When she gets home, she begins a relationship with Cort. Cort has been in love with her most of his life, but Andie has no intention of sticking around. Gert is a hard as nails kind of lady, but Franks presence seems to be drawing her back into the past. Reminiscing about the past softens her. Makes her look on Andie and Cort with new eyes, but will her help be enough when an unexpected visitor suddenly appears. Evenfall, was definitely fresh and different. It was a sad story. I was sad for Gert. Sad for Frank, even for Clara. I found myself believing, better yet understanding why Frank couldn't leave. I wanted them to be able to go back and make different choices. I wanted Andie to stop and make different choices. This was an amazingly visual and well-written novel. A fantastic debut, no doubt. However, I feel like the plot line which originally drew me in fell a little short. The synopsis promised a supernatural tale about a ghost who, having given up the love of his life by marrying her sister, returned from the grave to make sure that his niece (aptly named Andrea--points to the author for a fabulous name, even if it was shortened to the offensive "Andie" for most of the book) doesn't make the same mis This was an amazingly visual and well-written novel. A fantastic debut, no doubt. However, I feel like the plot line which originally drew me in fell a little short. The synopsis promised a supernatural tale about a ghost who, having given up the love of his life by marrying her sister, returned from the grave to make sure that his niece (aptly named Andrea--points to the author for a fabulous name, even if it was shortened to the offensive "Andie" for most of the book) doesn't make the same mistake. The human element of the story, particularly Andie's romance with 10-years-younger Cort, a boy she used to babysit, is particularly moving, but the ghostly element was barely there. It only served as a useful tool to tell some backstory. The ghost himself seemed to play almost no role in the book's events at all, except for a few moments here or there where a supernatural presence was merely hinted at. I truly liked this book, and the writing was breathtaking, with an attention to detail I'm both jealous of and impressed by. I just think it had so much promise with the ghostly element, so as a result, I think it lost that little something extra. I would still recommend this book, and I hope to read more books by this author in the future. Liz Michalski is a new author for me, and contemporary romance books are not exactly my forte, but this one caught me from the very beginning and kept me interested throughout the entire story. There were several things that I thought were excellent about this book, and a few that I found disappointing. I enjoyed the characters of Andie, Cort, Gert and Frank. In fact, from the description of the book, I expected Frank to play a bigger role and was kind of disappointed that he wasn't more prevale Liz Michalski is a new author for me, and contemporary romance books are not exactly my forte, but this one caught me from the very beginning and kept me interested throughout the entire story. There were several things that I thought were excellent about this book, and a few that I found disappointing. I enjoyed the characters of Andie, Cort, Gert and Frank. In fact, from the description of the book, I expected Frank to play a bigger role and was kind of disappointed that he wasn't more prevalent. In fact, my favorite parts of the book were the parts that dealt with the story of Frank and Gert and their short circuited romance. It was a typical story of love and loss, underscoring the adage that you only live once....there are no do overs. I felt that their story was much more compelling than what was happening in the current time. Luckily for me, most of the book dealt with that story and the effect that their relationship had on everyone over the years. I have to say, though, that I did not particularly like the ending. Not because it was not well written, or didn't fit the story, but just because I wanted it to end differently in a few areas. "Nina sees the man first. It’s a warm summer day, the kind where, when I was alive, you’d have found me down by the creek. Fishing, I’d have said if anyone asked, though the only thing worth catching there was a long, cool breeze." These are the opening lines of Evenfall, Liz Michalski’s debut novel. Given my fascination with ghosts, I knew from that second sentence that this was a book I could not put down. The prose is beautiful, the love stories bittersweet, the longing and regret palpable. T "Nina sees the man first. It’s a warm summer day, the kind where, when I was alive, you’d have found me down by the creek. Fishing, I’d have said if anyone asked, though the only thing worth catching there was a long, cool breeze." These are the opening lines of Evenfall, Liz Michalski’s debut novel. Given my fascination with ghosts, I knew from that second sentence that this was a book I could not put down. The prose is beautiful, the love stories bittersweet, the longing and regret palpable. The house, Evenfall, is not just a setting, but a character. The dog, the cat, even the goats and a snapping turtle are integral to the story, not mere props. The Murphy women, Frank, and Cort are all believably flawed and you love them for it. Neil is so flawed I wished I could scratch his eyes out. Men, don’t be frightened off by “love story.” I know of several guys who openly admit to having enjoyed Evenfall, particularly a certain few pages. Word of warning: don’t hand it to a teenager without reading said pages first! your life is a powerful and true one. and they are short ones. appreciated those from frank's pov as a ghost. strengths so well in all her actions and dialogue. I want to live at Evenfall. It's a 200 year old home set in the countryside surrounded by the woods, a creek, and a small cottage tucked away nearby. Andie, the niece of the owner, arrives to help her Aunt Gertie get the place ready to sell after the death of her Uncle Frank, who was married to Gertie's sister Clara. Frank and Gertie had been in love as teenagers, and Gertie left town, thinking she was doing the right thing by leaving Frank. Now, fifty years later, Frank is dead, and haunts the I want to live at Evenfall. It's a 200 year old home set in the countryside surrounded by the woods, a creek, and a small cottage tucked away nearby. Andie, the niece of the owner, arrives to help her Aunt Gertie get the place ready to sell after the death of her Uncle Frank, who was married to Gertie's sister Clara. Frank and Gertie had been in love as teenagers, and Gertie left town, thinking she was doing the right thing by leaving Frank. Now, fifty years later, Frank is dead, and haunts the house he shared with Clara, and where Andie and Gertie would spend the summers while Andie was growing up. He is filled with regret over his lost love, Gertie, and is trying very hard to communicate with her. "Evenfall" is just the light-filled and effortless story-telling that I needed to refresh my love of reading. I had struggled a little through my last two books so it felt wonderful to have a novel that I wanted to devour over just a few days. I'm always intrigued by stories with ghosts and was very excited when I was chosen to receive this through First Reads. I have to say though that "Evenfall" is not really about Frank the "ghost." He plays a wonderfully sad role in the story, yet it is trul "Evenfall" is just the light-filled and effortless story-telling that I needed to refresh my love of reading. I had struggled a little through my last two books so it felt wonderful to have a novel that I wanted to devour over just a few days. I have to say though that "Evenfall" is not really about Frank the "ghost." He plays a wonderfully sad role in the story, yet it is truly the story of two women, Andie and her Aunt Gert, learning about regret and learning to listen to the the right voices in their lives. It's also about defining what really is your home, your heart and your family.